Waiting is not something that comes easily to most people. This is especially true in India where everybody is a leader and there are no followers. It is the survival of the fittest and works to the letter T in every situation where you have to wait. and standing in a queue in other countries and in India. 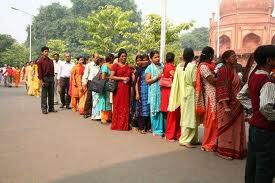 A queue is an ordered line of people or tasks waiting to be attended to in the order of first come, first served basis. However, we Indians cannot stand in a queue in an orderly manner. The common reaction in our country is, “Why do I have to waste time standing in a queue?” For any purpose—buying a ticket, paying bills, in hospitals, at the check in counter at airports, supermarkets etc.—our good intention is to join the queue, wait and achieve our goals in an orderly and patient manner. Reality however is different. Driven by fear and the gut instinct of survival of the toughest, you don’t dare leave any space between yourself and the person ahead! And, this can really be a sticky experience in our weather conditions. The only rule that works is to hold your place in the line and watch whether your feet are grounded. The training to wait patiently and to stand in a line begins in school –to line up for assembly, enter and leave classrooms and board buses in an orderly manner. At play time, we implicitly obeyed our teachers to ‘get in line’ before being marched off. Once we grew up and left school, we also forgot these simple rules. Queues can be entertaining. You make instant friends, you have discussions about everything under the sun and collectively you strain at the leash to move ahead and reach the goal. If it is a wait to lodge a complaint, the sharing of grievances and the inequities of authorities can be a very satisfying experience. In a common queue, if any guy dares to get close to a lady ahead, he could end up at the receiving end of a few thwacks from handy footwear! So in India, we also have special Ladies lines. A common queue could also be the scene of a mini riot when unscrupulous queue jumpers could sidle up and occupy dangerous blank spaces and usurp your place! Lifts and public transport are other hot spots where people rush to get in forgetting altogether that unless the vehicle empties, there won’t be any space for them. It is GIGO here too—Guys in Guys out! You see, the fear is that you may literally miss the bus or lift in this case. The scene in religious places is not different. People jostle and knock others down in a great hurry to have a darshan of their favourite deity. Queues that are carefully monitored and guided at initial stages in these temples, become a mass of human bodies, any which way, closer to the sanctum sanctorum. Surely, the same people would not be so eager to actually have their final rendezvous with the Almighty! In the USA or UK people of Indian origin patiently wait for their turn at traffic signals and in other queues. The same people at an Air India counter in JFK or Heathrow regress rapidly to push and pull to reach the check in counter or to board the plane. They want to come back home the earliest, so waiting be damned. Whenever, wherever I have to wait, I take a book and happily sit reading with only a few anxious glances to check the progression ahead of me. When I have to wait unexpectedly, I spend the time ‘people watching’ and that is a great pastime. Welcome to the Friday Loose Bloggers Consortium where Akanksha, Anu, Ashok, Conrad, Delirious, Gaelikaa, Grannymar, Magpie11, Nema, Noor, Ordinary Joe, Paul, Maria the Silver Fox, Rummuser , Will Knott, and I write on the same topic. Please do visit the linked blogs to get seventeen different flavours of the same topic. This entry was posted in Friday Loose Bloggers Consortium, Life skills, Wellness and health and tagged impatience, queue, survival of the fittest, wait. Bookmark the permalink. What a wonderful display of colour in the queue you have pictured above. It would keep my attention to really shorten the wait. When I do have to queue it becomes an opportunity to discover people. I watch how people move, their body language, and how they treat others around them and finally I try to imagine what their lives are like. Life is a book, and the story goes on around us all the time. When I lived in China, they did not have the concept of the queue. It was horrible trying to pick up a package at the post office, or order food at McDonald’s! We had to just push and shove our way to the front like everyone else. That’s just the way it’s done there. Very miserable! One of the good things about the internet – less queueing. Sounds like you have found a good way of waiting in line. Reading a book has always been a good answer for me and lately, since my books are now on my Ipad, i read from that or if I can sit and wait, I playthe games, particularly bookworm, to make the time go faster. Aww Maria! I used to have a downloaded version of Bookworm and play it…now it is not available…miss it…but I play Mahjong on my PC. Seriously thinking about getting an I Pad.